2. Cut up all ingredients into small squares and mix into the eggs. Add seasoning to taste. 3. Heat up a pan on medium heat and spray some canola or olive oil into it. Pour in egg mixture and allow to cook. Fold into three from each end to form the omelette. 4. Before serving, decorate with fresh coriander leaves. Sounds easy right? 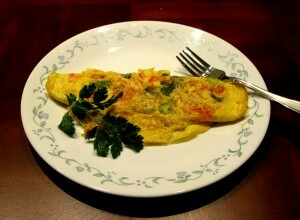 But you’ll be amazed at how some people can’t make a simple thing like an omelette, including me! (Mine always end up being scrambled no matter what I do)!